Snowflakes, Minority Nations, Mucha, and Candies at War | Blah! Here are some interesting sites I’ve been meaning to mention for a while, finally getting to them. I’m posting them here both to share with others but also as a reminder to me to check them out once in a while. 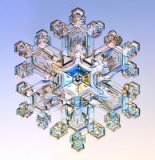 SnowCrystals.com is a site “all about snow crystals and snowflakes.” They have an amazing collection of images of snow crystals of various types. They have a guide of the various basic types of snow crystals; they classify 35 different types of crystals. Their photos include both natural snowflakes, like the one at the left, as well as crystals grown in their laboratory. They even go into the physics of snowflake formation, so you can have an understanding of what causes the different structures to form. But, really, the draw is the beautiful pictures. Eurominority is dedicated to all of the Stateless Nations and minority peoples of Europe. Of course, the reason I found the site in the first place was my interest and connection to the Basque people, who turn out to be one of many minority peoples throughout Europe. If you are like me, you tend to think of the countries of Europe as pretty homogenous. For example, I used to think of Spain as flamenco dancers and bull fighters. However, Spain has at least three minority regions — the Basques, the Catalans, and the Gallegos — and even more depending on how you look at it. And Spain is by no means unique; most countries in Europe have several minority groups with their own languages. Eurominority documents those nations and regions. Most interesting to me were the maps they have of Europe broken down into stateless nations and regions. Spain, for example, in one map is comprised of Gallicia, Cantabria, Asturias, the Basque Country, Catalunia, Aragon, Castilla, Valencia, and Andalucia. Very interesting perspective on Europe. The image here is a map of the languages of Europe. When I was in Helsinki, visiting the accelerator lab for a month in October/November, the weather was pretty bleak and there wasn’t too much to do. I did make it to their art museum, which had an exhibit on Alfons Mucha, a Czech painter of the late 1800s/early 1900s. His style was very unique, at least to my eye, and he has become one of my favorite artists. He specializes in the female form, and did a lot of posters for plays, beers, and perfumes. His style has since been imitated quite a lot, and will is easily recognized in modern graphic design. A foundation and a museum have been dedicated to him and his work. The image here was taken from Illusions Gallery, which has a small gallery of some of his work. What happens when candies make war on one another? That is the premise of the animated movie Goobees. What would cause gumdrops to do battle with chocolates? Goobees is a short animation film from Texas A&M. The animation is pretty nice and the concept is somewhat twisted. A nice example of what can happen when a good imagination is paired with the tools to bring that imagination to life.